NEW YORK, Nov. 28, 2017 /PRNewswire-USNewswire/ -- Ahead of World AIDS Day 2017, (RED) – the AIDS organization founded by Bono and Bobby Shriver – announces it has delivered a total of $500 million to the Global Fund, to fund HIV/AIDS programs in sub-Saharan Africa. Since (RED)'s founding in 2006, the money raised through special events and campaigns led by more than 100 private sector partners, supporters and creative collaborators has benefited the lives of 110 million people through treatment, prevention, testing, counseling and care services. Tune In to Jimmy Kimmel Live! Bono, co-founder, (RED), said; "Half a billion dollars to prevent and treat AIDS – now that's a reason to punch the sky. When Bobby Shriver and I started (RED) just over a decade ago we had big goals, but even our big heads couldn't have dreamed up a number like that. This achievement belongs to the (RED) companies and consumers who have supported (RED) and raised a load of money and a load of awareness about AIDS - which is more the point because our experience is if there isn't heat and excitement around an issue, big government budgets get cut and people die." (RED) is fortunate to have had the transformational support of the Bill & Melinda Gates Foundation, which has generously provided matching funds for key campaigns to multiply the impact of individual and corporate donations. For the third year in a row, the Gates Foundation will be matching every dollar raised for (RED)'s SHOPATHON, up to $15 million. 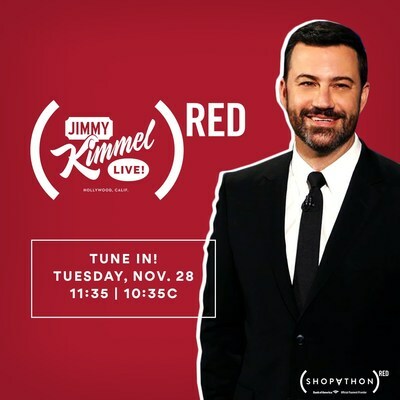 For the third year running, Jimmy Kimmel is generously donating his show to support (RED)'s Shopathon. Bono, Ashton Kutcher, Bryan Cranston, Kristen Bell, DJ Khaled and more will all appear on the show packed with live music, interviews and irreverent holiday shopping fun to fight AIDS. The Jimmy Kimmel Live! (RED) Special airs November 28th, 11.35pm ET / 10.35 CET on ABC. "I am honored and excited to host our Third Annual (RED) special again this year to continue the fight to end AIDS with help from some of the shiniest stars in the world" said Jimmy Kimmel. (RED) and Amazon have teamed-up for special holiday shopping offering brilliant (RED) products that raise money for the Global Fund to fight AIDS. Shoppers can choose from more than 150 (RED) products including fashion, cosmetics, kitchen goods, tech and more at Amazon.com/RED or via the Amazon App. Sharing smart ways to shop and give back, stars including Neil Patrick Harris, Tyra Banks, DJ Khaled, Ricardo Kaka, Allison Williams, Javier Muñoz, Jay Ellis, and Yvonne Orji highlight their favorite (RED) products to give – and get - on Amazon.com/RED.